They say, you know you are in Chennai when you hear kaapi instead of coffee. Though, Chennai is much more than kaapi, summer waves, and insane traffic, something one can learn from following quotes. Tamilians love to irritate non-Tamil speakers by speaking in Tamil only. 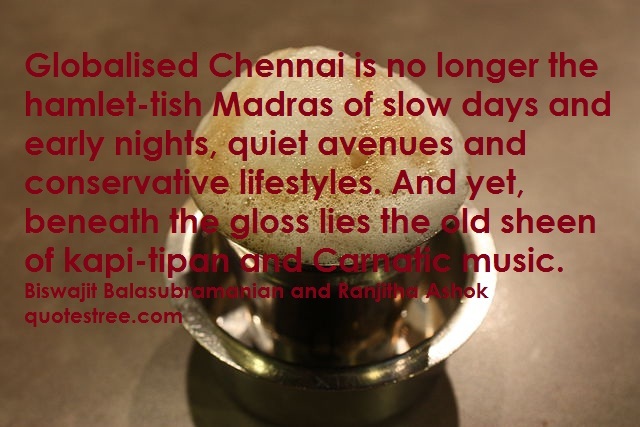 Globalised Chennai is no longer the hamlet-tish Madras of slow days and early nights, quiet avenues and conservative lifestyles. 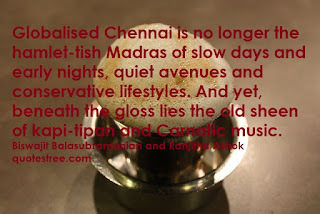 And yet, beneath the gloss lies the old sheen of kapi-tipan [Coffee and Snacks] and Carnatic music. Chennai is a great city, and if they had great weather it could be paradise, but it is not. Everything is top volume,be it heat, humidity, or crowd's ability to whistle. It is not a place for faint hearted. I blame Chennai. Pointless neighbourhood gossip travels faster than tsunami alerts around here. I know that aunties are a universal problem but this city is particularly aunty dominated. The expression ‘pleasant weather’ may be an oxymoron for Chennai, where the climate is famously split between hot, hotter and hottest.